Six people have been arrested as part of an investigation into the supply of cocaine from Europe to Australia and New Zealand. The investigation is being carried out by the Garda Drugs and Organised Crime Bureau, which is working closely with the Australian Federal Police. At least six premises have been searched in Drumcondra, Artane, Finglas and Swords and around €250,000 has been seized, according to gardaí. Some of the five men, who are aged between 27 and 31, and a 24-year-old woman in custody have recently returned from Australia. They are being held at a number of Dublin garda stations under anti-gang legislation. The investigation is being carried out by the Drugs and Organised Crime Bureau, which is investigating the activities of the Kinahan crime gang. Gardaí say the operation is indicative of the scale of the Kinahan gang's international drug dealing operation. The officer in charge of the investigation has said further arrests are expected. He also said that today's operation is focusing on the money trail. Speaking on RTÉ's Six One News, Mr O'Driscoll said young Irish people in Australia were the gang's target market. 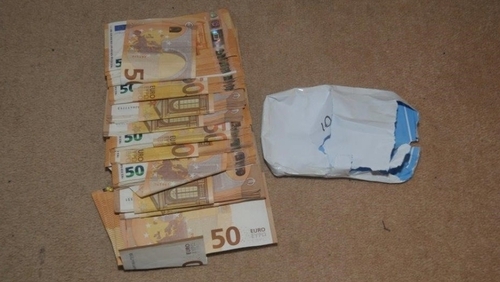 The six people who are being questioned this evening have been arrested on suspicion of money laundering. Gardaí say their search operations are continuing.